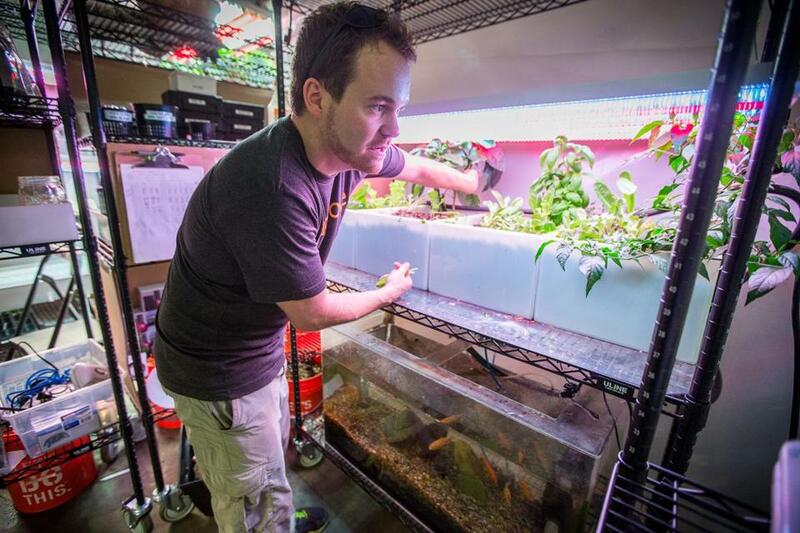 Aquaponics engineer Tim Day of Grove Labs works with plants that use fish waste as fertilizer at Greentown Labs. A fast-growing Somerville clean technology incubator that provides space for nearly 50 startup businesses will soon also house a test lab for a French-based global corporation. The agreement between Greentown Labs and the French building materials giant Saint-Gobain was announced in Paris during the recent trade mission that Governor Deval Patrick made to expand opportunities for partnership among Massachusetts and European Union firms in the innovation economy. Through the new partnership, Saint-Gobain will use its space at Greentown to test new technologies. It will also make the space available to some of the startup firms at Greentown to test their products and offer the expertise of its staff to assist those young firms in refining their prototypes. The deal is for two years, with an opportunity for renewal. “This partnership between Greentown Labs and Saint-Gobain is further evidence that Massachusetts clean tech companies are competing in the global marketplace,” Patrick said in a prepared statement. Founded by four startups in a condemned Cambridge warehouse in 2011, Greentown has grown steadily, moving first to the basement of a warehouse on Boston’s Summer Street and last September to its current custom-built facility in Somerville’s Ames Business Park on the site of the former Ames Safety Envelope Co.
Greentown, which is geared to helping clean technology businesses get started, has grown from 25 companies to about 50 since arriving in Somerville. Its startups collectively employ about 170 people full time and – counting interns and contractors – about 260 people in all. The startups housed at Greentown’s 33,000-square-foot facility share space and equipment to work on their prototypes. The businesses, which are charged leases, also receive professional resources from Greentown, including guidance with legal, accounting, and other needs. Greentown has enlisted other major corporations – such as Chevron, Shell, and National Grid – to serve as sponsors of the incubator, providing funding and other assistance. A recent agreement with EnerNOC (Energy Network Operations Center) will provide the Boston-based software company with space at Greentown to collaborate with the startups. But the Saint-Gobain partnership will give Greentown a testing facility that can be shared by tenants, a first for the incubator. Currently, startups test prototypes in their own spaces or at off-site facilities, according to Emily Reichert, Greentown’s executive director. It will also give Greentown and its startups the ability to tap the expertise of an international corporation that describes itself as the world’s largest construction materials company. Reichert and Mark Vasu, Greentown’s executive vice president, were part of the delegation accompanying Patrick on the French portion of his trade mission, which also included stops in Denmark and the United Kingdom, and were among those on hand when the agreement was announced at the US ambassador’s residence in Paris. One of the ways Somerville wooed Greentown to the city was a $300,000 low-interest economic development loan. The loan was conditioned on the incubator adding nine new jobs, at least 51 percent of them held or available to low- or moderate- income people. O’Donnell said Greentown had exceeded those terms. The Massachusetts Clean Energy Center, a quasi-state agency that works to stimulate the state’s clean technology sector, has supported Greentown with two grants totaling $300,000. It also provided the incubator with a $150,000 loan to assist with its relocation to Somerville and has provided $24,000 in funding for interns, according to Alicia Barton, the center’s chief executive. Saint-Gobain, which celebrates its 350th anniversary next year, had $55.5 billion in sales in 2013. The firm already has a notable presence in Massachusetts, employing about 2,400 people at a research and development center in Northborough and at production facilities in Northampton, Norwood, Taunton, and Worcester, according to Anne Hardy, director of the Northborough center. The Saint-Gobain staff deployed at Somerville will come from the Northborough facility, according to Hardy.